Greek Prime Minister Tsipras made two fundamental errors in his negotiations with the Troika. Second, to make a possible withdrawal from the euro credible, the Greek government should have secretly printed a warehouse-full of “New Drachma” several weeks ago, then shown it to the Troika. Without an immediately available new currency the Greeks were always at the mercy of the ECB. When you join a currency union your own central bank ceases to be the ‘lender of last resort’ in your economy. That role belongs to the ECB. With depositors seeking to withdraw their money from Greek banks, the Greek government found itself at the mercy of the ECB’s Emergency Liquidity Assistance (ELA) – which at the end of the day is the ability of the central bank to move truck-loads of Euros to Greek banks running out of cash. With its determination to stay in the euro at any cost, the Greek government was bound to be brought to its knees when the ECB stopped shipping the cash. The Greek economy would have become a barter economy in a matter of days and this would have led to a rapidly deepening recession. Armed with its warehouse full of New Drachma and a willingness to leave the euro-zone if the conditions for remaining were unacceptably tough, the Greek government would have been in a much stronger position to negotiate better terms (less austerity and debt relief). Or, failing that, to exit the euro without a huge immediate crisis by issuing New Drachma to banks over a weekend, converting all euro accounts to New Drachma, and suspending – or even cancelling – all Greek sovereign debt. The threat of such an outcome would have concentrated minds in Germany and elsewhere. The lesson is a basic one for negotiators. Power in a negotiation depends on having a good Best Realistic Alternative (BRA). If you don’t have one, you need to construct one. If you do have one – in Greece’s case the BRA was to leave the euro – you need to ‘stiffen’ it to make it plausible to the other side. Stating a willingness to leave the euro rather than accept further austerity, and printing New Drachma, would have radically altered the balance of power in the negotiations. 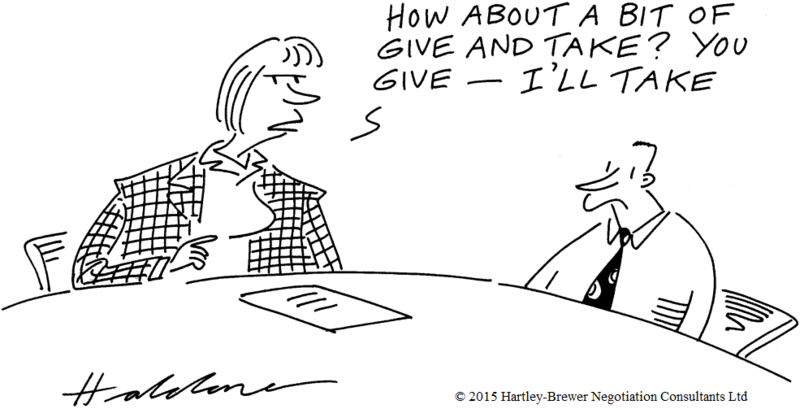 Negotiation is the most important skill in business. When the stakes are high, only the best will do. Hartley-Brewer are the leading provider of expert negotiation training and consultancy to a wide variety of global brands.